I hesitated to make this recipe, since I'm not so crazy about mushrooms...but I do LOVE zucchini. I figured the mushrooms wouldn't take the flavor forefront in the recipe, as they were mixed with bread crumbs, olives, pine nuts, basil, parmesan, and Trader Joe's FABULOUS Sun-Dried Tomato Pesto. 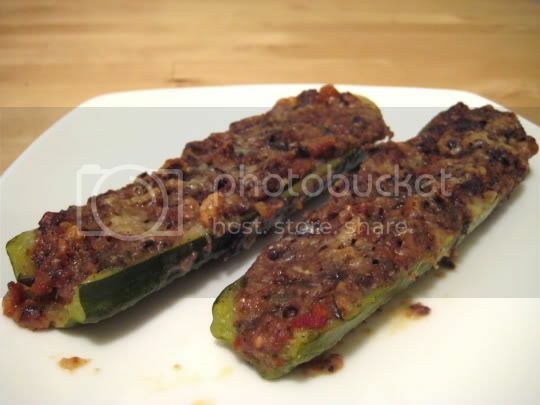 A few pulses in the blender provided a nice filling for the hollowed-out zucchini halves, which then baked for almost an hour. ...voila, a delicious dinner arose from the ashes. 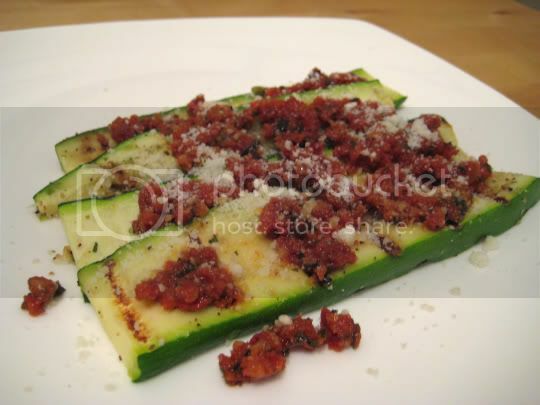 George Foreman-grilled and lightly garlic-salted and peppered zucchini slices, spread with sun-dried tomato pesto, and sprinkled with Parmesan. Make again? MAYBE...I'd give my delicious zucchini and pesto another chance.